Moving on to Part 4 of the Photoshop tutorial series on how to create simple photo borders or frames. This is the first time though that I will be using Photoshop CS3 on Mac instead of CS2 on Window-based PC. (Hehe…recently switched to a 20-inch iMac). Not to worry, this tutorial can be applied with other Photoshop versions, and Windows users just need to remember that Mac’s keyboard keys Command (Cmd) and Option/Alt (Option) mentioned here are the same as Window’s keys Ctrl and Alt respectively. Here, I intend to share how easily you can add borders/frames to digital photos or images, using Layer Styles, specifically applying borders inside your photos, rather than outside which can also be done but will not be covered in this tutorial. This process is most ideal for photos with a lot of unwanted background or unappealing areas that you want removed, yet not wanting to retouch or crop but retain the image size as is. Simply applying a single Layer Style effect or combination of effects to create an attractive frame inside the image will automatically hide the undesirable areas, as seen in these ‘before and after’ images of Christmas Palm fruits. In my opinion, framing photos this way is by far the most versatile and easiest. 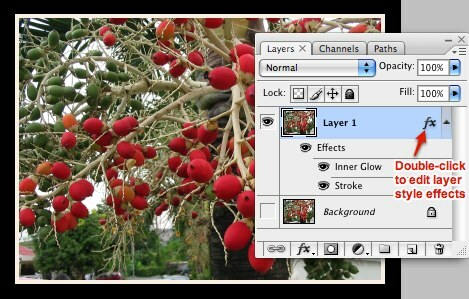 You can choose the many marvelous and fascinating effects available to customize your own Layer Styles to suit your photos. And, the best part is you get to see the styling effects straightaway on your document as you’re adding them. This helps tremendously to better determine your choices and settings. 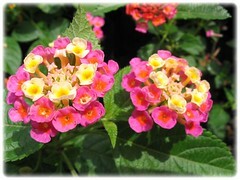 The effects are extremely variable and so user-friendly that any newbie to Photoshop can easily apply them in a breeze. Moreover, you can save any combination of the effects you have applied as a new Layer Style to be reused on other layers/documents. Great, huh! Step 1. In Photoshop, open the image that you want to use – press Cmd+O (Window: Ctrl+O) or go to File > Open to browse, choose and open your image. A simpler way is to drag your image from iPhoto Library or Finder and drop it onto the Photoshop icon in the Dock at the bottom of your screen. Step 2. Duplicate the Background Layer (Cmd+J). 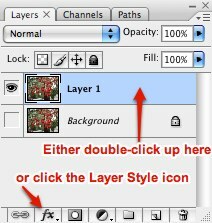 Photoshop will automatically name it Layer 1 in the Layers Palette. Double-click on the name and rename it if you wish. Then, click on the Eye icon to the left of the Background layer to remove visibility as not needed anymore. go to Layer > Layer Style > Blending Options. 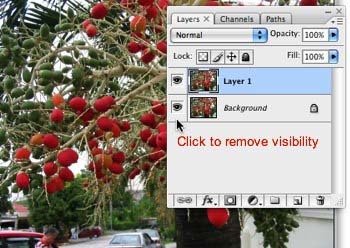 As a guide, here is an image of the Layer Style dialog box with Blending Options as default. You can use any one of Photoshop preset styles by clicking the word Style at the topmost left of dialog box and a collection of them will be displayed for you to choose. A single click on any of the preset styles is all it takes to add that style to your targeted layer. Otherwise, you can create your own Layer Style by choosing a single effect or combination of various effects as listed in the left column. Before you start, see that the Preview box on the right side is checked, to enable the effects to be seen right away on your document as they are being applied. To apply any individual effect, click on its name (not the checkbox) to enable it, and its options for your choice of settings will be displayed in the center column. 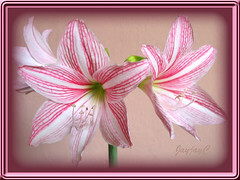 Try experimenting the many fantastic variables available to better determine what best suit your picture and your taste. Do the same for the next effect and so on if you want more. If you change your mind, just uncheck the box to the left of that named effect to disable, or check to enable again. To edit any effect already applied, simply click on its name and adjust settings as desired. When you are finally delighted with the results seen on your photo (document), simply press OK to apply the set of effects and options chosen and exit the Layer Style dialog box. Better still, before exiting, save your customized effects as a new style by clicking the New Style button on the right column and it will be stored in the Styles Palette for future reuse. If you forget here, you can still do this in the Layers Palette: select the layer having the style that you want saved as a preset, then click the Create new style icon in the Styles Palette. 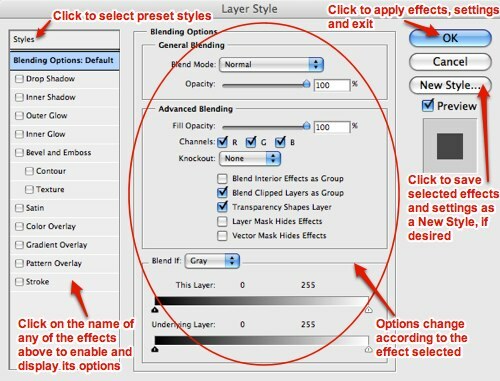 Should you change your mind after exiting and want to edit layer effects already applied, just return to it by double-clicking on the Layer effects icon (letter fx) or the specific Layer effect name in the Layers Palette, to bring up the Layer Style dialog box and make the desired adjustments. The layer effects commonly used to create borders and frames inside an image are the Stroke, Inner glow, Bevel and emboss, even Inner shadow. Their options are so varied that a single effect or a combination of effects applied can present such captivating results. Presented below, are just a few examples of photo frames/borders created with Layer Styles, including the effects and options/settings selected. 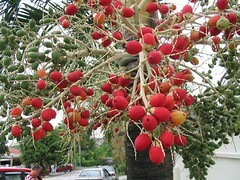 Image of Christmas Palm fruits (Veitchia merrillii). Here, 2 solid-colored borders were drawn, a black to complement the red fruits and a beige for contrast. 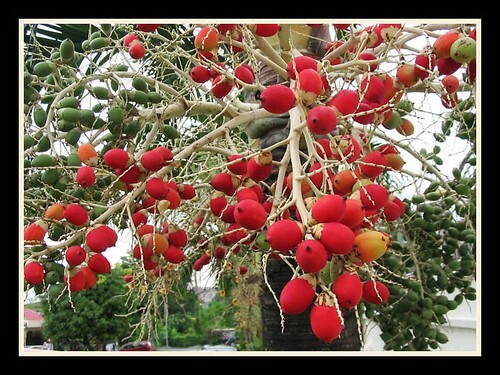 The result – a simple yet attractive frame to cover the undesirable left foreground and bring focus to the fruits therein. (Tip: you can even type in your signature, copyright or greetings on the black border, and if it isn’t broad enough, just increase the Stroke size). 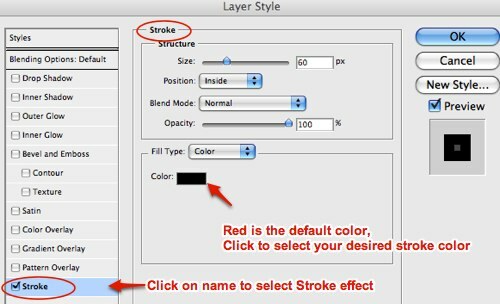 (1) Stroke: Stroke size – 60px, Position – Inside, Blend mode – Normal, Opacity to 100%, Color – black #000000. 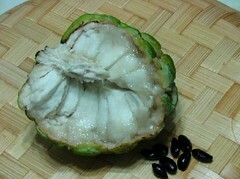 Image of Annona squamosa (Sugar or Custard Apple), from our tropical garden. Only a single inner glow effect was applied to hide unappealing areas seen at top corners. Applying this effect with the following settings would usually result in an uneven outline which I find rather appealing and quite arty. Placed on a white background, it would appear as if the image had shrunked. 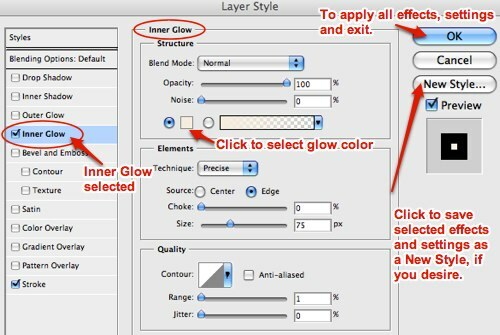 (1) Inner Glow: Blend Mode – Linear Dodge (Add), Opacity – 80%, Color – light yellow #ffffbe, Technique – Softer, Source – Edge, Choke – 0%, Size – 68px, Contour – Linear, deselect Anti-aliased, Range – 40%. Modifying the options slightly as follows will reap this lovely appearance, as seen in our Lantana camara image – with softer rectangular edges and roundish corners. Inner Glow: Blend Mode – Normal, Opacity – 100%, Color – white #ffffff, Technique – Softer, Source – Edge, Choke – 0%, Size – 35px, Contour – Linear, deselect Anti-aliased, Range – 35%. 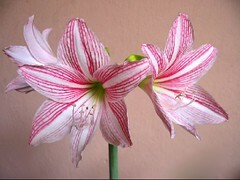 Image of Hippeastrum ‘Mrs Garfield’, from our tropical garden. A combination of 3 layer effects to create a fancy frame with wonderful color contrast to enhance the beauty of the gorgeous blooms. (1) Stroke: Stroke size – 25px, Position – Inside, Blend mode – Normal, Opacity to 100%, Color – pink #f492bc. (2) Inner Glow: Blend Mode – Normal, Opacity – 100%, Color – #6f2d3e, Technique – Softer, Source – Edge, Choke – 0%, Size – 100px, Contour – Linear, deselect Anti-aliased, Range – 20%. (3) Bevel and Emboss: Style – Inner Bevel, Technique – Smooth, Depth – 80%, Direction – Up, Size – 23px, Soften – 0px, Angle – 120 degrees, deselect Use Global Light, Altitude – 30 degrees, Gloss Contour – Linear, deselect Anti-aliased, Highlight Mode – Screen, Color – #ea97bb, Opacity – 100%, Shadow Mode – Multiply, Color #430f1c, Opacity – 100%. Ending here will produce an elevated beveled-border as seen in the right image, giving an overall 3-D look. Lovely too! Or you can continue to apply a contour to the bevel, which was done for this example (effects seen in the after-framing image above) – click the name Contour on the left column, and select Contour – Sawtooth 1 (click on the drop-arrow to open the Contour Picker to make your choice), deselect Anti-aliased, Range – 50%. Do experiment with the various contour styles available and play with the range glider to see their wonderful effects – you will be amazed! Or you may want to customize your own style – click on the contour image to open the Contour Editor which will enable you to make variations, and don’t forget to save for future use. 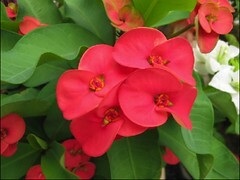 Image of Euphorbia milii’, from our garden. Applied the following combination of styling effects to create an interesting 3-D frame, just to share further the amazing power of Photoshop. (1) Stroke: Stroke size – 12px, Position – Inside, Blend mode – Normal, Opacity to 100%, Color – green #3d7532 (selected from the image with the Eyedropper tool). (2) Inner Glow: Blend Mode – Normal, Opacity – 100%, Color – white #ffffff, Technique – Precise, Source – Edge, Choke – 0%, Size – 55px, Contour – Ring-Double, deselect Anti-aliased, Range – 10%. (3) Inner Shadow: Blend Mode – Multiply, Color – #a7b98c, Opacity – 83%, Angle – 45 degrees, select Global Light, Distance – 31px, Choke – 0%, Size – 13px, Contour – Linear, deselect Anti-aliased. (Tip – There’s an easier way to set the Angle and Distance options. Simply click anywhere inside your image and drag your mouse around. As you drag the mouse, you’ll see the inner shadow being created and the values for Angle and Distance changing dynamically. Stop dragging when you’re pleased with the results). (4) Bevel and Emboss: Style – Pillow Emboss, Technique – Smooth, Depth – 100%, Direction – Up, Size – 57px, Soften – 0px, Angle – 45 degrees, select Use Global Light, Altitude – 30 degrees, Gloss Contour – Linear, deselect Anti-aliased, Highlight Mode – Screen, Color – #85d823, Opacity – 100%, Shadow Mode – Multiply, Color #497a14, Opacity – 57%. That’s it. Enough examples to start you off. Do try out the many fantastic variables, do not be afraid to experiment. You will be stunned to know how creative and artistic you can be. Frankly, applying layer effects is such an easy and quick method to draw fanciful, artistic and beautiful frames/borders to your images. 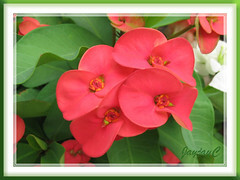 In fact, this is my favorite way of framing my pictures for Flickr photostream. View previous photo framing tutorials: Part 1, Part 2 and Part 3, if you wish. Better still, select photoshop tutorials from gallery of thumbnails.